Hemoglobin (Hb), the pigment that gives blood its red colour, provides the transport of blood gases. It carries oxygen from lungs to the rest of the body and a portion of carbon dioxide in the opposite direction. Hb transports 98 % of the total oxygen present in the blood and 23 % of CO2. Hemoglobin also forms an important blood buffer system, which removes the excess of H+ (particularly in peripheral tissues) by binding them to the His- residues of its molecule. The blood concentration of hemoglobin differs between sexes: in women 120-162 g/l and in men 135 – 172 g/l. The molecule of hemoglobin was discovered already in year 1840, but it was not until around 1870 that an important French physiologist Claude Bernard revealed its function. The molecule of hemoglobin is mostly spherical and, as its name suggests, it is made of two main parts – globin molecule (polypeptide) with an embedded heme prosthetic groups. The whole molecule is a tetramer, consisting of four subunits joined together by H- bridges and ion bonds. Hemoglobin therefore has a quaternary structure. Every globin molecule binds exactly one heme molecule (which is a cyclic tetrapyrrole) with a central Fe2+ ion. The heme itself makes up only 4 % of the entire molecule. Metal ions used in catalysis have to be firmly attached to a specific site of the molecule. It is achieved via so-called coordination (or dative) bonds, which form an ion complex. Ion complexes possess a central atom of metal surrounded by a different number of ligands. Ligands have free electron pairs, which they donate to the metal ion and thus form a bond. Each cyanide anion within the molecule of ferricyanide possesses a non-binding electron pair capable of forming a bond with the free orbital in the valence layer of the ferric ion. Heme represents a special type of complex called chelate complex. Chelates are formed when ligands contain more than one binding site that joins them to the metal atom. Fe2+ has a strong tendency to be oxidized by oxygen in watery environment to Fe3+. That makes it important for heme to be situated in a hydrophobic pocket formed by a polypeptide chains of globulin molecule. Heme is a member of the group of substances called porphyrins, characterized by a cyclic structure and the presence of four pyrrole nuclei joined by –CH= bridges (methine bridges). It therefore belongs to the tetrapyrroles. The difference between porphyrins and tetrapyrroles, which both contain four pyrrole nuclei, lies in their structure. Tetrapyrroles can be linear, whereas porphyrins are always cyclic and therefore represent a subgroup of tetrapyrroles. Thanks to the presence of many delocalized double bonds, porphyrins are coloured substances. Electrons surrounding atoms or forming the bonds between them are able to absorb electromagnetic waves and their energy, which results in their transfer to a higher orbital. Electrons present in double bonds (so-called π electrons) only absorb high-energy UV radiation and the substances containing solely isolated double bonds are therefore colourless. The conjugation of double bonds (and delocalization of π electrons) decrease the amount of energy necessary for their excitation and thus increase the wavelength of the light that the substance can absorb. What we observe as a colour is in reality the complementary colour to the one absorbed by the substance (heme is red because it absorbs blue-green light). Red colour of heme is therefore not a result of the presence of Fe cation, but is based on the presence of delocalized electrons within the porphyrin cycle. 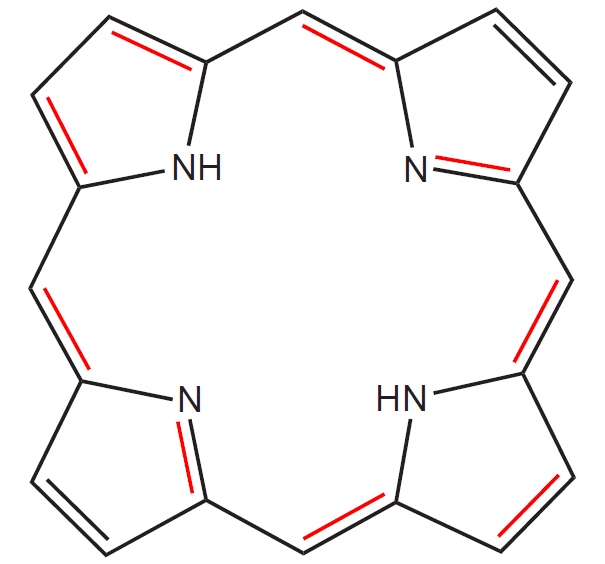 Porphyrins bind their central atom of metal with four N atoms present in pyrrole nuclei. 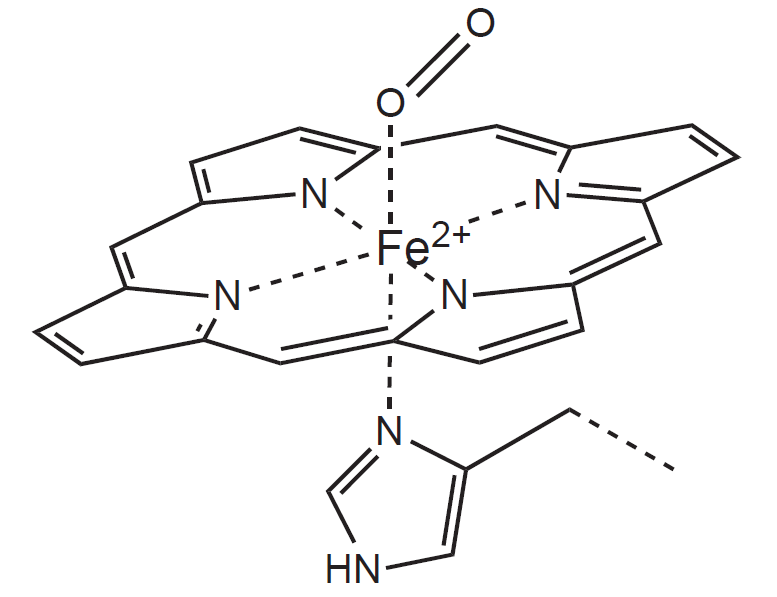 Iron (both ferri and ferro form) prefers to bind more than four ligands only and thus two more ligands can bind perpendicularly to the plane of the cycle. In the case of heme, the fifth place is occupied by a His residue of the globin chain and the last (sixth) can bind the molecule of O2. 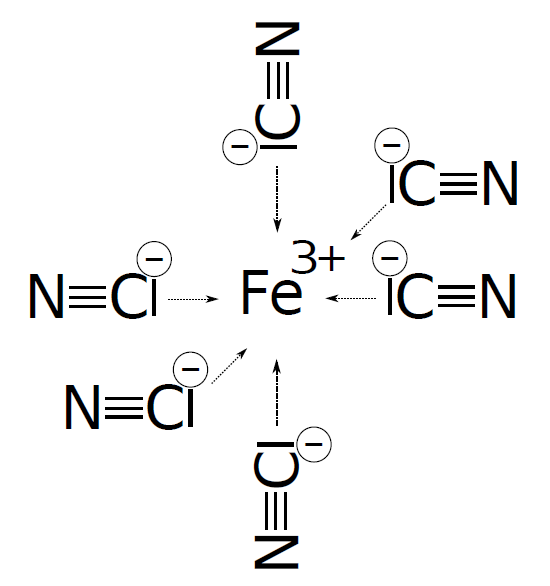 Within the molecule of heme, the Fe2+ ion has a total of 6 coordination covalent bonds (represented by a coordination number 6). According to the type of polypeptide chains (α, β, γ, δ, ε a ζ), we recognise several types of hemoglobin molecule. The molecule is always made of two pairs of chains and the chains belonging to the same pair are of an identical type. 1. Hb A1 (2α2β): major form of Hb in adults and children over seven months. Hb F is synthesized in fetus, but after birth it is quickly eliminated and replaced by HbA. In newborns it forms up to 70 % of their hemoglobin. HbF binds and dissociates O2 at lower partial pressure of oxygen than HbA and so it binds the oxygen that dissociates from maternal hemoglobin in placenta more readily. The saturation curve of HbF is shifted to the left. In adults, the fetal hemoglobin forms around 0.5 % of the total hemoglobin. In the first weeks of the intrauterine development, the cells of the embryonic yolk sack (forming blood islands) start the production of embryonic hemoglobin that is later replaced by HbF. We recognise several types of HbE: Gower I (2ζ2ε), Gower II (2α2ε) or Portland (2ζ2γ). These forms of hemoglobin can arise from a various defects of its synthesis, for example due to a point mutation resulting in a change of one amino acid for another with different properties. Hb S (2α2β): HbS hemoglobin carries a point mutation in the gene coding the β chain, which causes the inclusion of Val to the 6th position (instead of Glu) and causes the change in the isoelectric point of the globin chain. Erythrocytes with HbS have a shortened lifespan (only 10 to 20 days, compared to the usual 120 days), but at the same time they are more resistant to the Plasmodium protozoan infection causing malaria (so-called advantage of the heterozygote). Deoxy form of the Hbs forms long chains joined to form thick filaments that cause the change of the shape of erythrocytes from the normal biconcave to a sickle shaped. The deformation also results in the deterioration of the elastic properties of cells. The ability of erythrocytes to pass through even narrow capillaries is impaired and the vessels can become clogged. The disease is called sickle-cell anemia. 1) Oxyhemoglobin (oxyHb): Hb with an oxygen molecule attached to the Fe2+ atom, having brightly red colour. 2) Deoxyhemoglobin (deoxyHb): Hb without oxygen, being dark red in colour. 3) Carboxyhemoglobin (carboxyHb): Hb with CO bound to the iron atom. CO binds to the Fe2+ about 200 to 300 times more tightly than O2 and that is why, even though the bond is reversible, under the conditions of a normal atmospheric pressure, oxygen cannot displace CO from the bond. This state leads to a decreased capacity of blood to transport oxygen causing tissue hypoxia. Affected people develop pink (cherry) skin colour, because carboxyhemoglobin has a crimson red colour. We can speed up the regeneration of oxyHb under higher partial pressure of oxygen (e.g. in hyperbaric chamber). The disintegration of COHb can also be encouraged by light and i.v. administration of methylene blue. 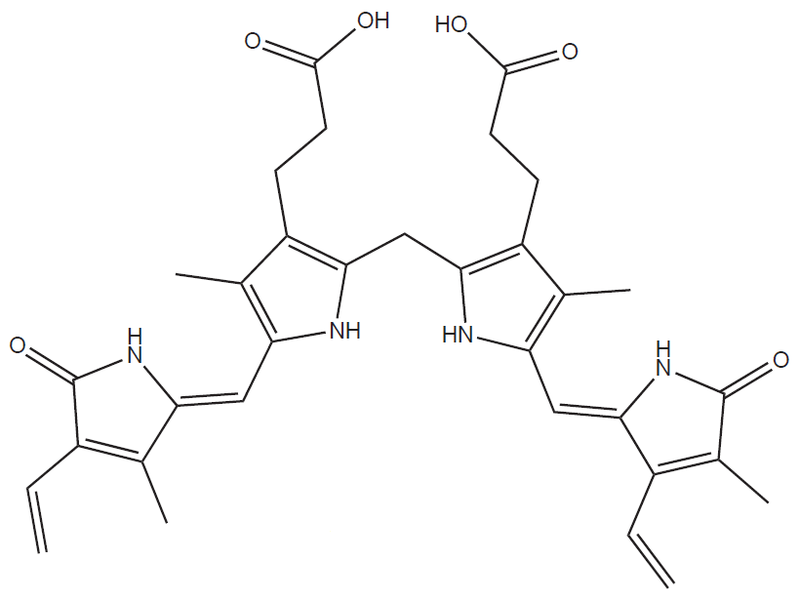 4) Methemoglobin (metHb): formed by an oxidation of heme Fe2+ to Fe3+. The oxidation is physiological up to a certain point. Normally the metHb makes up about 0.5 to 1 % of the total amount of hemoglobin in the blood. The reverse reduction is carried out by an enzyme methemoglobin reductase. Due to an underdeveloped enzymatic antioxidative system, children under 1 year are particularly susceptible to methemoglobin poisoning called methemoglobinemia. It can be caused by drinking tap water (which contains nitrates). Inside the body, nitrates are converted to nitrites that afterwards oxidise the heme iron. 5) Carbaminohemoglobin (carbaminoHb): Hb with a CO2 group attached to -NH2 group of the globin molecule, which is dark red in colour. 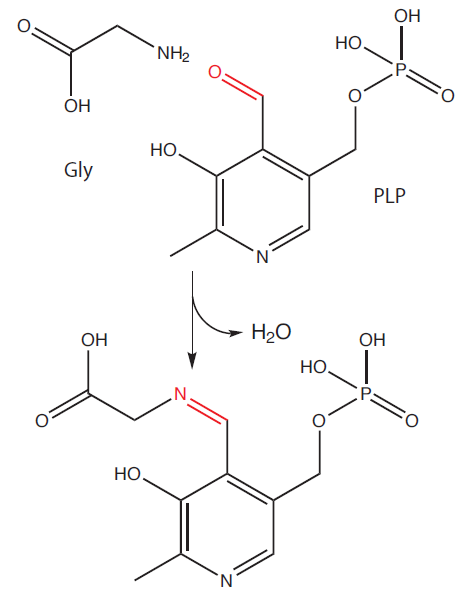 6) Cyanohemoglobin (cyanoHb): forms by binding CN– instead of O2 molecule to Fe2+. 7) Glycated hemoglobin (HbA1c): Hb, whose globin chains posses non-enzymatically attached glucose molecules. Healthy person has the values of HbA1c ranging from 2.8 to 4.0% of total hemoglobin. Diabetics tend to have higher quantities (depending on how well the disease is controlled). By measuring the amount of glycated hemoglobin we can trace back the compliance of the patient with the treatment. 1) First step takes place in mitochondria. 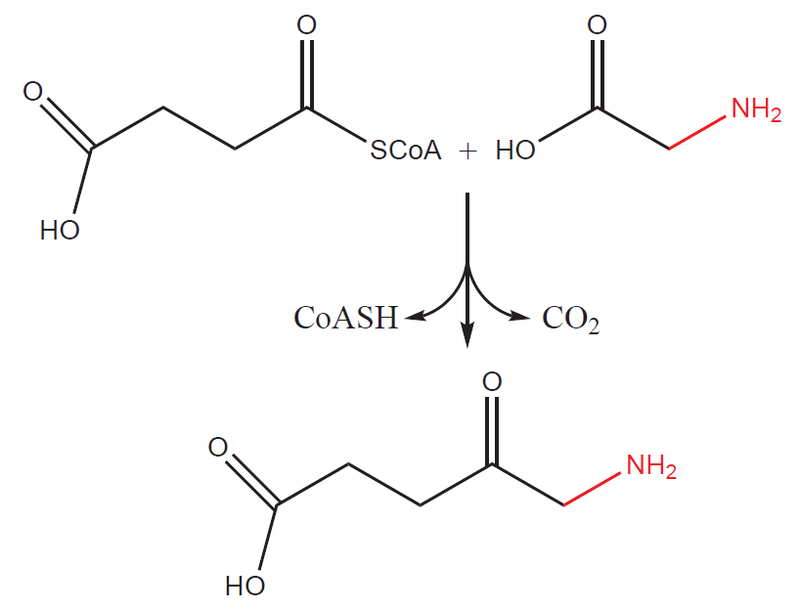 Succinyl-CoA (intermediate product of Krebs cycle) reacts with glycine to form a 5-aminolevulinic acid (also called δ-aminolevulinic acid, ALA). The process is catalyzed by an enzyme ALA– synthase (ALAS). The reaction is at the same time rate-limiting (determining the overall rate at which the synthesis takes place) and therefore regulatory step of the whole pathway. ALAS is regulated by the end product of the pathway –heme via a negative feedback. Surplus of heme inhibits the transport of enzyme from the site of its synthesis (cytosol) to the mitochondria and thus inhibits the course of the pathway (in the cytosol, the enzyme is slowly degraded). ALAS uses pyridoxal phosphate (derivative of vitamin B6) as a cofactor. 2) Two molecules of ALA join together to form a monopyrrole – porphobilinogen (PBG) in a reaction catalyzed by ALA dehydratase (PBG synthase). ALA dehydratase is a metalloenzyme containing Zn molecule. Lead poisoning causes the replacement of Zn by Pb leading to the destruction of its catalytic activity. 3) Four PBG molecules than combine and create the first tetrapyrrole – hydroxymethylbilane (HMB). The first cyclic tetrapyrroles synthesized from the linear hydroxymethylbilane do not yet contain a cycle of conjugated double bonds and therefore are colourless. 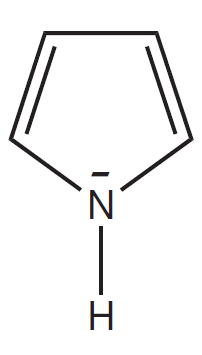 These “unsaturated” tetrapyrroles, precursors of porphyrins, are called porphyrinogens. 4) Hydroxymethylbilane is cyclised and forms uroporphyrinogen III, which is, through a series of other steps (involving coproporphyrinogen III), turned into protoporphyrinogen IX, the last “unsaturated” precursor molecule. 5) Protoporphyrinogen IX is transported back to the inner mitochondrial membrane where it is oxidized to protoporphyrin IX. Oxidation creates the system of conjugated double bonds and turns the colourless porphyrinogen into the red coloured porphyrin. 6) The last step of synthesis is the insertion of Fe2+ cation, catalyzed by an enzyme ferrochelatase (FECH, heme synthase). The main site of heme degradation is MPS (mononuclear phagocyte system), consisting of phagocyte cells – mainly liver macrophages (so-called Kupffer cells) or macrophages of spleen, bone marrow and subcutis (histiocytes). In the case of intravascular hemolysis (the breakdown of red blood cells within the blood vessels), the released hemoglobin binds to haptoglobin (or, in the case of free heme, to hemopexin) and the complexes of hemoglobin-haptoglobin (heme-hemopexin) are absorbed by MPS. The molecule of hemoglobin is split into globin and heme. Globin chain are hydrolysed to amino acids and reutilized. Enzyme heme oxygenase, with the help of an oxygen molecule and NADPH, breaks down the porphyrin cycle by cleaving one of the methylene bridges (and releasing it in a form of CO) and releases Fe as well (as a Fe3+ cation). The resulting tetrapyrrole is called biliverdin. Biliverdin still contains conjugated double bonds causing its green colour. Biliverdin is subsequently reduced by biliverdin reductase to the main degradation product of heme catabolism – bilirubin. Bilirubin in poorly soluble in water and that is why it needs to have a transporter in blood – it binds to albumin (so-called unconjugated, indirect bilirubin). Due to its poor solubility, the unconjugated bilirubin does not appear in urine, but is able to pass through the underdeveloped hematoencephalic barrier of newborns (especially, when some other substance displaces it from the albumin or when it is formed quantities exceeding the binding capacity of albumin). The toxicity of bilirubin to the nerve cells causes damage to the brain leading to so-called kernicterus. Unconjugated bilirubin bound to the albumin is transported to liver, where it conjugates with one or two molecules of glucuronic acid. Catalyzed by UDP glucuronyl transferase, an ester bond is formed and the resulting bilirubin mono– or diglucuronides are excreted through bile into the intestines. Reduction in the activity of transferase causes an illness called Gilbert’s syndrome and complete defect results in Crigler–Najjar syndrome. Conjugation of substances with glucuronic acid takes place in various detoxication reactions as well – see Subchapter 9/6. Deconjugation process takes place in the intestines and the intestinal bacteria reduce bilirubin to urobilinogen and stercobilinogen. Portion of the urobilinogen is reabsorbed back to blood and can be found in urine. Most of the urobilinogen and stercobilinogen is converted by bacteria to stercobilin and urobilin and is excreted through faeces. The solubility of gas in blood depends on the solubility coefficient of that particular gas (e.g. the coefficient of CO2 is 22 times higher than of O2) and usually has a linear dependence on the partial pressure of the gas. Examples include gases bound to hemoglobin, plasma proteins or (in the case of CO2) a molecule of HCO3–. Some of these substances (including hemoglobin) have only a limited binding capacity, determined by the total amount of the substance in blood plasma. Partial pressure of gas in a mixture of gases is defined as a hypothetical pressure of that gas, if it alone occupied the volume of the mixture at the same temperature. It is therefore influenced by the concentration of the gas in the mixture and the total pressure of the mixture. The partial pressures are denoted with the letter p: pCO2, pO2 etc. Due to the poor solubility of oxygen in water, one liter of blood contains only about 3.2 ml of dissolved O2, making up 1.5% of the total amount of oxygen in blood. This dissolved fraction depends linearly on the pO2. The most important mean of oxygen transport in blood is through hemoglobin. Every Fe2+ cation reversibly binds one molecule of O2 and hemoglobin oxidizes to oxyhemoglobin. One mol of hemoglobin thus, when fully saturated, binds 4 moles of oxygen molecules. As a consequence, the amount of oxygen transported by 1 g of Hb (oxygen binding capacity) in vivo is about 1.35 ml. At the usual concentration of Hb in blood (160g/l) 1 l of blood carries approximately 216 ml of O2. When oxygen binds to one of the globin subunits of hemoglobin molecule, other subunits undergo a conformational change that increases their binding capacity for oxygen (allosteric effect of oxygen). Conformation of the molecule of deoxyHb is termed a T state (T for tense, because the molecule has lower affinity for oxygen) and that of the oxyHb a R state (R for relaxed, having higher affinity for O2). There exists a gradual transition between the T and R state, determined by binding and releasing of oxygen from the individual subunits of hemoglobin. The more subunits bind the molecule of oxygen the more it approaches the R state and vice versa. The binding of oxygen causes a local conformational change of that particular subunit, which weakens the association with the other subunits. The allosteric effect is nicely illustrated by the sigmoidal shape of the hemoglobin saturation curve. The saturation curve depicts the dependence of the hemoglobin saturation by oxygen (usually given in percents) on its partial pressure (in kPa). Saturation represents the proportion of the oxygenated hemoglobin to its total amount in blood (and thus its total hemoglobin transport capacity). 100 % saturation means, that all the hemoglobin molecules have oxygen attached to them. The curve shows, how the saturation changes in accordance to the changes of O2 partial pressure. The saturation sharply increases within the range of 1.3 to 5.3 kPa (10 to 40 mmHg). The reason is the above-mentioned allosteric effect – even a single oxygen molecule bound to the hemoglobin increases the affinity of all of its subunits, which, as a result, bind other oxygen molecules more readily. When the hemoglobin becomes fully saturated the curve reaches a horizontal plato. This occurs at pO2 between 9.3 to 13.3 kPa (70 to 100 mmHg). The blood leaving lungs is on average 97 % saturated, the mixed venous blood (leaving peripheral tissues) has saturation of about 75 %. When the pCO2 increases and the carbaminoHb forms, the affinity of Hb for oxygen decreases and the saturation curve experiences a right shift. The change in affinity helps to release the oxygen in the peripheral tissues, where the concentration of CO2 is higher. In lungs, where the partial pressure of CO2 decreases as it is breathed out, the affinity of Hb for O2 rises again. pH affects the course of the curve almost identically with the effect of pCO2, because CO2 significantly influences the pH of the environment. The drop in pH (apart from being caused by an increase in CO2) can be a result of an increased production of non-volatile acids, e.g. lactic acid produced during an anaerobic metabolism in muscles. Decreased pH together with the formation of carbaminoHb decreases the affinity for oxygen and shifts the curve to the right (so-called Bohr effect). On the other hand, an increase in pH and drop in pCO2 has an opposite effect. Increased temperature decreases the affinity of hemoglobin for oxygen and shifts the curve to the right. This influence is particularly apparent during muscle work that generates heat. Increased temperature in periphery facilitates the release of oxygen from its bond. 2,3 – BPG binds to β-chain of the hemoglobin molecule causing a conformational change that leads to a decrease in affinity for oxygen. Erythrocytes synthesize 2,3 – PBG at an increased rate for example when being at higher altitudes or after physical activity. Its effect on HbF is milder than on HbA. A binding curve of CO has an extremely sharp initial rise due to high affinity of hemoglobin for CO. A relatively low pCO is necessary to quickly reach the maximal saturation. On the contrary, a binding curve of metHb-O2 stays at 0, because Fe3+ does not have the ability to bind oxygen. In the case of HbF, the entire curve is shifted to the left, because HbF has a higher affinity for oxygen than HbA. It is caused by less 2,3- BPG molecules bound to HbF. Myoglobin, unlike hemoglobin, does not posses quaternary structure, it only consists of one polypeptide chain. That is why its saturation curve does not have sigmoidal shape. Myoglobin shows higher affinity for oxygen and serves in muscles as its reservoir. One liter of arterial blood contains approximately 30 ml of CO2, one liter of venous blood 35 ml. This amount represents around 5% of the total amount of CO2 in blood. a) HCO3– represents the main transport form of carbon dioxide in blood, transporting 80-85% of all CO2. b) At a lesser extent CO2 reversibly binds to amino acids of hemoglobin and plasma proteins and forms carbaminoHb and carbamino proteins, which together transport the remaining 10 – 15% of CO2. This reaction occurs without the catalysis as well (directly in the blood), but it proceeds only very slowly. That is why there is 1000 time more dissolved CO2 in the blood than H2CO3. Over 70 % of the H2CO3 formed in the erythrocytes leave them through a special HCO3–/Cl– antiport in exchange for Cl– anions. The process is called Hamburger effect (or chloride shift) and similar transfer takes place in parietal cells of gastric mucosa (HCl synthesis) or in renal tubular epithelium (HCO3– reabsorption). Cl– is osmotically active and thus, as it enters the erythrocytes, water molecules follow it. The volume of red blood cells increases (due to an intake of water) and the hematocrit of venous blood is about 3 % higher than that of arterial blood. The H+ cation formed during dissociation of carbonic acid binds to hemoglobin that acts as buffer. Deoxygenated hemoglobin is more basic than oxygenated and that is why it binds protons more readily.